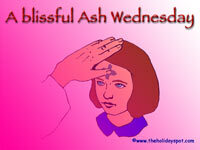 Today is Ash Wednesday the first day of the season of Lent. Christians are invited to the altar to receive the imposition of ashes. Ashes are applied on the forehead in the form of a cross. Imposition of ashes reminds penitent of their sins and the good news that through Jesus Christ crucified there is forgiveness for all sins. Ashes remain in the foreheads throughout the day not for any other reasons but Christians do it as a witness that all people are sinners and needs repentance. That through faith and Jesus Christ all sins are forgiven. The Imposition of ashes like any other similar traditional Christian practices is meaningless unless there is inner repentance and change of behaviour. Christians however are free to observe or not to observe it. Though this is recommended for Christians as a great opportunity for repentance and spiritual renewal with the support of confession and forgiveness. A blessed Ash Wednesday observance to all! Long time ago I decided to create another blog. I could not immediately start then because I had a hard time deciding what will be the concept and the title of it. I made my first two content on Personal notes here last Nov 2010 and it stopped there. Now I am back, I will do my best to be able to share relevant and useful content here related to my iExpress blog categories.